Oregon Vortex- A vortex, essentially a whirlpool of force, is the basic form of our universe. From our galaxy, whose vortex form we see as the countless suns of the Milky Way, throughout the gravitational vortex of our solar system, down to the vortex of an atom, the vortex form recurs throughout our world structure. 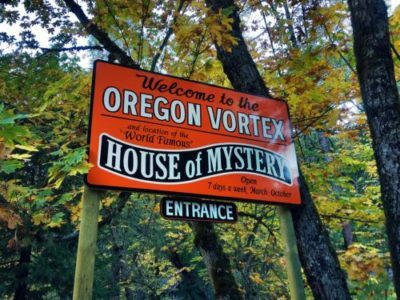 The Phenomena that gives The Oregon Vortex its name are evident throughout the entire area. Nowhere in the circle do you normally stand erect. Inevitably the visitor assumes a posture that inclines toward magnetic north. The corona of The Vortex, as well as the minor vortices, discovered during the continuous study of The Vortex, are among the unique phenomena to be observed here. Laurel Hill Golf Course- Laurel Hill Golf Course opened on August 6, 1977. It was the creation of the late Harvey Granger (1909-1997), who moved to the Rogue Valley in the early 60’s after farming in Fremont, CA for thirty years. In addition to his ranch in the Applegate, he acquired part of the Chavner Thompson property near Exit 40 off I-5, with the idea that a portion of it could be turned into a golf course. Laurel Hill owes its popularity to two factors: it is challenging enough for expert players, and short enough not to intimidate beginners. Secondly, for 38 years we’ve been devoted to providing great golf along with great food and drink in a friendly atmosphere, at a reasonable price. The course is open to the public year-round that also includes an option of an annual membership for the avid golfer. For most of the year, we have an all-day rate of $15 for men (on Thursdays) and women (on Mondays). 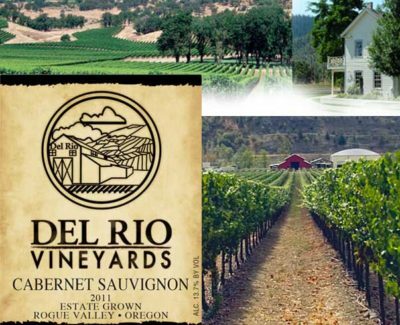 Del Rio Vineyard -The rolling hills, majestic landscape and wild Rogue River converge to create the optimal setting for growing superior grapes. Established in 1997, the single vineyard has blossomed under the nurturing hands of 4th generation farmers. With our blend of family heritage and farming excellence striving to consistently provide you with the finest examples of Oregon wine made today. Once home to the Rock Point hotel, originally built in 1864, the tasting room provides for a rustic and warm atmosphere while sipping wine. The facilities include a great outdoor location for a family picnic with a wonderful view of the vineyard. Open any day of the week from 11am to 5pm.